Ok, is it too early to consider working off all the candy and junk food from Halloween? Over the weekend we traveled to North Carolina to see family, and I was able to get some good reading done in the car. I came across an article in Real Simple that I wanted to share about mood-boosting workouts. A 2010 study published in the Journal of Alternative and Complementary Medicine examined anxiety and the moods of people who practiced yoga 3 times a week for an hour. Practicing yoga increases levels of GABA, an amino acid and neurotransmitter that can lower anxiety, according to neurologist Chris Streeter, a psychiatrist and the lead author of the study. The slow, deep breathing of yoga increases oxygen flow which leads to the "optimal" functioning of all organs, including your brain. 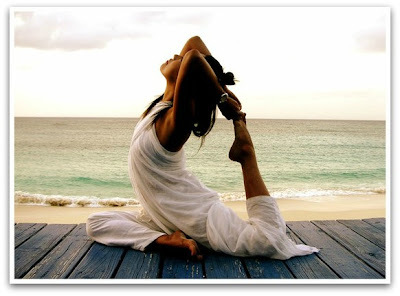 Another 2010 study published in the Al Ameen Journal of Medical Sciences found that the parasympathetic nervous system, the part of our nervous system that promotes relaxation kicked into "high gear around three months after starting yoga," says Dr. Anita Herur, professor of Medicine, S. Nijalingappa Medical College, India. The article states that if you're new to yoga, the first thing you should do is to learn the correct breathing. Lynn Louise Wonders, a yoga instructor from Georgia says "breathe in through your nose to the count of five. Hold for two counts, then exhale through your nose to the count of five, emptying your lungs completely. Repeat this five times." Once mastering the breathing, go to the Yoga Alliance Registry to find a yoga class near you. If you prefer to get the hang of it at home, there are MANY DVDs available. I personally have used DVDs from Christian Yoga, as I am uncomfortable with some of the Eastern prayers, etc. I found that in place of a devotional at night these DVDs were very calming, relaxful, and full of scripture. I have followed regular, or more traditional yoga as well, and the beginner yoga instructions are the same for both. Remember eBaY or OnDemand is a good place for these as well! I really like Yoga Booty Ballet too. Through an online forum for LAWL a few years ago I was recommended this workout. The speakers and little drummer boy get annoying, but this mixes hip hop, aerobics and yoga into one workout. A common cause of problems sleeping can be linked to individuals having a hard time relaxing. It's difficult to get good sleep when you're stressed and can't wind down. A recently published study from Appalachian State University in Boone, NC found that practicing pilates was linked to better snoozing. Pilates was developed by a fitness "pioneer" Joseph H. Pilates in the 1920's, and is a core-strengthening workout done on the floor on on a Reformer apparatus. Study participants who did pilates on a mat two times a week for 75 minutes or three times a week for 50 minutes were less likely to experience troubled sleep. Karen Caldwell, Ph.D., the leader of the study says it's linked to an increase of body awareness. The article suggests beginners start by reading Joseph H. Pilate's book, Return to Life Through Contrology in order to fully comprehend pilates. From there, classes are highly recommended through gyms such as Crunch, Gold's Gym, Life Time Fitness, etc.) For noticeable results, aim for 3 times a week. I bought a set of Pilates DVDs a few years back and ended up selling them again on eBaY as I thought they were very difficult. The exercises definitely concentrate on your core, but if you have pudge or a belly and you're looking to get rid of it, it's even harder to do. Does that make sense? Know how crunches are harder with a belly? That's the feeling I got with pilates. I feel this article was stretching it a little bit? I feel that there are many forms of exercise that could make you sleep better, including walking. Researchers at the University of Georgia, Athens (UGA) found that after a 30 minute session of stationary riding, subjects reported an increase in their energy levels. In addition to the boost in energy, researchers recorded positive electrical changes in the brains of the subject's, related to energy. These measurements were taken by an electroencephalogram. Patrick O'Connor, a professor of kinesiology at UGA states "cycling seemed to activate brain neural circuits that make a person more energized." Kate F. Hays, Ph.D, a clinical and sport psychologist from Toronto states "we tend to think of physical activity as being tiring, but in fact physical activity adds energy to our lives." A light to moderate workout on a stationary bike 15 minutes three times a week will put some "pep in your step," states cycling instructor Rick Mayo from Georgia. The article goes on to say that you don't have to limit the workout to the gym, any kind of exercise done outdoors boosts energy more than an indoor workout. I took quite a few spinning classes with my sister when she was down here living in Virginia. The classes I took were 45-50 minute classes, but were really fun. I think the best part was definitely the music. We were finally able to listen to music that makes you want to work out, like Pink, Jay Z, etc. The only down part is the "adjusting" to the seat. 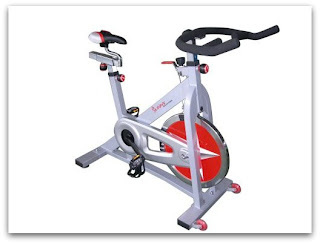 Those of you that have taken a spinning class are familiar with what I'm talking about. Beginners, the seat is very uncomfortable until you get used to it. I took them for about a month 2 times a week and never got used to it... just sayin'! In a November 2010 study, older adults who did simple, low-intensity weight training exercises three to five times a week for one month performed significantly better on cognitive tests than the control group. The cognitive tests that they scored higher on specifically was executive function, which is planning, regulating behavior, and multitasking,. Cay Anderson-Hanley, Ph.D., was the lead author of the study and assistant professor of psychology at Union College in NY. 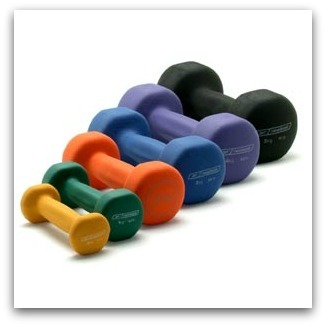 Beginners can do 3 sessions a week, using 3-5lb weights, following the Anderson-Hanley study available on the National Institute of Health website. The article states that the last set should be a challenge, and if it's too easy, look into a weight training class at a gym. Skip a day between workouts so your muscles can relax. The only exercises I have done with weights is carrying them while walking. Two recent studies linked tai chi to stress relief, one in the British Journal of Sports Medicine and the other in the Journal of American College Health. In tai chi, you repeatedly shift your weight back and forth, in a standing position, using the muscles in both your upper and lower body, as well as using rhythmic breathing. Because you shift your weight slowly and in a fluid movement, your muscles are relaxed and your mind is calm, which improves your balance, strength and flexibility. This is sometimes referred to as "meditation in motion" and is said to stimulate the body's life force, or as the Chinese refer to as Chi. Gaiam is a good source for instructional DVDs for Tai Chi, as well as the Tai Chi Foundation which will list classes and teachers in your area. For maximum benefits, strive to practice up to 20 minutes each morning. I have never tried tai chi, have you? Thanks for this informative post, I think I need to try Pilates. Same here. Good information, but now to fins the will power? I love this post :) I have always wanted to try yoga and Pilates. Yoga yoga yogaaaaa. I love it, just recently started. Honestly, I find yoga helps me sleep too. On a work-out day I do 30min of cardio then go to an hour long yoga class. I sleep so good. It's really helped my flexibility first and foremost, but my posture too! Definitely recommend it to everyone haha.